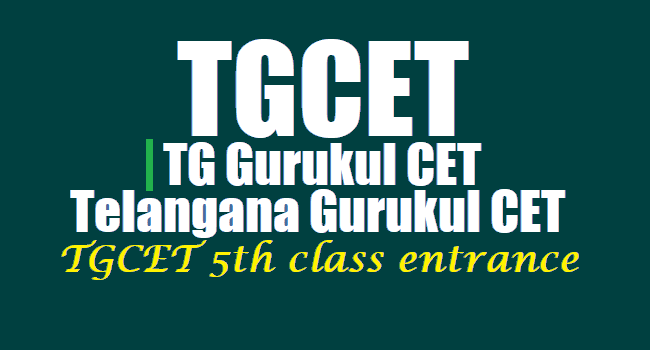 TGCET 5th class Entrace test Results, Merit list, School Wise Provisional Selection List 2019/ TGCET Results, Merit list for TG Gurukul CET 2019 5th class admissions/ #TGCET merit list /Certificates verification dates for TG Gurukul CET 2019 admissions counselling for 5th Class Admission to Telangana Residential Schools March 20: The last date to apply for Telangana Gurukulam Common Entrance Test or TGCET 2019 is ...-03-2019. TGCET is conducted for admission to 5th class in Telangana State Gurukulams(Residential Schools). Remember the last date to apply is March ..... The TS Gurukulam 5th class entrance exam for admission will be conducted on April .... This year the Telangana Government will also fill 240 seats in newly sanctioned 119 BC Gurukulams. The Gurukuls accredited with different Government Departments provide students enrolled with them with a lot of facilities such as free textbooks, stationery, coaching for competitive and entrance exams. 1. Age Limit for TS Gurukulam Common Entrance Exam for Class 5 admission: Candidate should be between 9-11 years of age as on September 1, 2019. There is a 2 years exemption in upper age limit for SC and ST candidates. 2. Educational Qualification for TGCET: Candidate should be a bonafide student of class 4 in the academic year 2018-2019. 3. Parental Income Limit: The annual income of parents of the candidate should not exceed Rs. 1,50,000 per annum for rural areas and Rs. 2,00,000 per annum for urban areas. TGCET~Telangana Gurukulam Common Entrance Test for TREIS, SC, ST and BC Welfare Residential Schools 5th Class admissions for 2019-2020. Step II: On the home page click on the link which says Apply for TGCET 2019. Step III: Click on the relevant links to download the prospectus and then click on the Application link. Step IV: Make application fee payment, which will generate a journal number required to proceed with the application process. Step V: Go back to the page with application form link and complete the application process. From the same page :http://tgcet.cgg.gov.in/index1.html. you can download a copy of the completed application form and hall ticket. TGCET 5th Class Common Entrance Test for TREIS, TSWREIS, TTWREIS, MJPTBCWREIS Residential Schools and 21st Century Schools Admissions. School Wise Provisional Selection List For Common Entrance Test for Admission into 5th Class for the academic year 2019-20 (in TREIS, TSWREIS, TTWREIS, MJPTBCWREIS) in 21st Century Schools.